I'm loving this new Elliott Lucca Wristlet that I purchased at Costco to replace a larger wallet. This wristlet holds all my necessary cards, has a bill holder and a change holder and holds my phone. Unfortunately, my phone with the Otter Box is big and clunky. 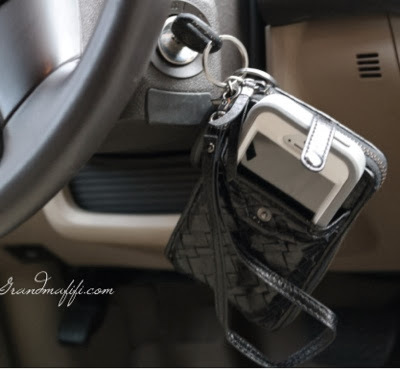 I might have to purchase a more streamlined case just so the phone looks better in the wristlet. Ever since shorting out an iPod when it fell into a pedicure chair, I've been choosing the maximum case. I don't use a handbag; I hook my keys onto my wallet and make the wallet my key ring. I'm looking forward to the day when my phone can start my car, draft my bank account and hold all tickets and identification, but, until then, this wristlet is as close as I've been able to get. What looks like an identical wristlet is available at Nordstrom for $48.00. I paid $24.99 at Costco. You shouldn't have all of the attached to your car key. You will damage the iginiton cylinder over time. All that weight puts stress on the tumblers can will cause them to wear irregularly and eventually fail. When that happens you will not be able to turn the key, and will have to replace the cylinder which is an expensive repair.